Algae are naturally present in slow moving water, and are important since they form the base of the aquatic food web. Stormwater washes nutrients like phosphorus and nitrogen into water bodies. When combined with warm water and sunlight this can cause algal blooms. 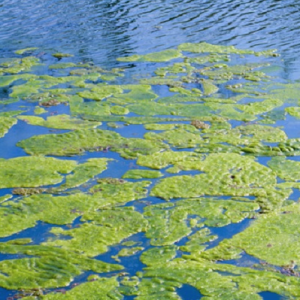 Some algae known as cyanobacteria can produce toxins that are harmful to people and animals. 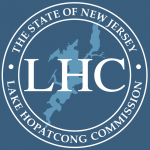 These are known as harmful algal blooms. Cyanobacteria are a type of bacteria capable of photosynthesis. Although they are not true algae, they are often referred to as “blue-green algae”. 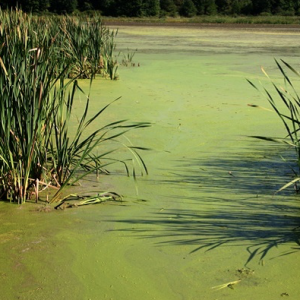 Cyanobacteria frequently impart off-tastes and odors to the water in which they grow. Some species can produce toxins (known as Cyanotoxins) that can be harmful to the health of humans and other animals. Although problems related to cyanobacteria most often occur in freshwaters (lakes and streams), cyanobacteria can also be found in marine waters. A cyanobacterial Harmful Algal Bloom (HAB) is the name given to the excessive growth, or “bloom”, of cyanobacteria, some of which can produce one or more types of potentially harmful toxins. HABs can occur under suitable environmental conditions of light, temperature, nutrients, and calm water. These “blooms” often result in a thick coating or “mat” on the surface of a waterbody, often in late-summer or early fall. A HAB often looks like a layer of bright bluish-green or white paint on the water surface. Other evidence of a potential cyanobacterial HAB could be discolored or pea-green colored water, parallel streaks, or green dots/globs in the water. It is important to note that some blooms are due to common green algae and not cyanobacteria and, when present, cyanobacteria do not always produce cyanotoxins.